According to the Big Bang model, the Universe expanded from an extremely dense and hot state, and it continues to expand today. A common analogy explains that space itself is expanding, carrying galaxies with it, like spots on an inflating balloon. The graphic scheme above is an artist’s concept illustrating the expansion of a portion of a flat universe. The Big Bang theory is the prevailing cosmological model that describes the early development of the Universe. According to the theory, the Big Bang occurred approximately 13.77 billion years ago, which is thus considered the age of the universe. After this event, the Universe was in an extremely hot and dense state, and it then began to expand rapidly. After the initial expansion, the Universe cooled sufficiently to allow energy to be converted into various subatomic particles, including protons, neutrons, and electrons. Though simple atomic nuclei could have formed quickly, thousands of years were needed before the appearance of the first electrically neutral atoms. The first element produced was hydrogen, along with traces of helium and lithium. Giant clouds of these primordial elements later coalesced, through gravity, to form stars and galaxies, and the heavier elements were synthesized, either within stars, or during supernovae. The Big Bang is a well-tested scientific theory and is widely accepted within the scientific community. It offers a comprehensive explanation for a broad range of observed phenomena, including the abundance of light elements, the cosmic microwave background, large scale structure, and the Hubble diagram for Type Ia supernovae. The core ideas of the Big Bang, the expansion, the early hot state, the formation of helium, and the formation of galaxies, are derived from these and other observations that are independent of any cosmological model. As the distance between galaxy clusters is increasing today, it is inferred that everything was closer together in the past. This idea has been considered in great detail, suggesting an environment of extreme densities and temperatures, way back in time. Large particle accelerators have been built to experiment in similar conditions, resulting in further development of the model. On the other hand, these accelerators have limited capabilities to probe into such high energy regimes. There is little evidence regarding the absolute earliest instant of the expansion. Thus, the Big Bang theory cannot, and does not, provide any explanation for such an initial condition; rather, it describes and explains the general evolution of the universe going forward, from that point on. Georges Lemaitre first proposed what became the Big Bang theory in what he called his “hypothesis of the primeval atom.” Over time, scientists built on his initial ideas to form the modern synthesis. The framework for the Big Bang model relies on Albert Einstein’s general relativity theory, and on simplifying assumptions such as homogeneity and isotropy of space. The governing equations had been formulated by Alexander Friedmann. In 1929, Edwin Hubble discovered that the distances to far away galaxies were generally proportional to their redshifts, an idea originally suggested by Lemaître in 1927. Hubble’s observation was taken to indicate that all very distant galaxies and clusters have an apparent velocity directly away from our vantage point, and the farther away, the higher the apparent velocity. While the scientific community was once divided between supporters of the Big Bang and those of the Steady State theory, most scientists became convinced that some version of the Big Bang scenario best fit observations after the discovery of the cosmic microwave background radiation in 1964, and especially when its spectrum (i.e., the amount of radiation measured at each wavelength) was found to match that of thermal radiation from a black body. 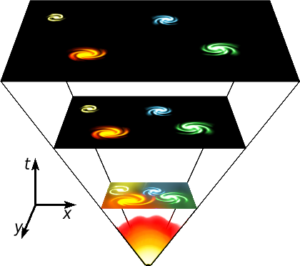 Since then, astrophysicists have incorporated a wide range of observational and theoretical additions into the Big Bang model, and its parametrization, as the Lambda-CDM model serves as the framework for current investigations of theoretical cosmology.